Dean Moon, founder of Mooneyes, accomplishments are like a bright yellow thread that weaves through the tapestry of hot rod history, from the pre-WW2 era through the 1970s. What teen motorhead in the Sixties didn’t have a Moon Eyes sticker on his high school Pee-Chee folder? Or on his hand-me-down ’59 Bel Air? It all started in 1927 (the year of Charles Lindbergh and the ’27 Yankees) when Dean was born in New Richland, Minnesota, son of a gas station owner who moonlighted by running moonshine. After his father, Dallas, was busted, the family sold the station and headed to California, landing in Norwalk. His father purchased a cafe in nearby Santa Fe Springs, a gritty industrial town in the heart of SoCal oil fields. As a youngster, Dean worked at the renamed “Moon Cafe” as a bus boy and cook, but he was more interested in stirring the pot in the single-car garage out back. By age 16, Moon was crazed for cars, particularly those that went fast. For his first car, though, he settled on an American Austin coupe, a curious stubby 2-door coupe, sort of a 1930s version of a SmartCar. While the Austin was unimpressive, Dean’s penchant for innovation was anything but. In the Whittier High School metal shop, he machined up a fuel block to distribute gas to multiple carburetors. So inspired, he began selling the fuel blocks to speed buffs. World War II soon intervened, and Moon found himself in the merchant marines steaming towards Japan as part of the post-war occupation. Once discharged he returned to California and resumed working on hot rods, honing his machinist skills, and performing tune-ups for a local Lincoln-Mercury dealer. But he couldn’t shake his desire to design speed parts. He enlisted a 1931 Ford Model A as a test mule on which he developed throttle linkages, fuel blocks and dual-point ignitions — all in a quest for increased horsepower. And he was an avid racer, testing his innovations at El Mirage on various roadsters in his stable. He found time to serve as secretary of the famed Russetta Timing Association. He was a devoted street racer as well. He and his fellow Hutters Car Club members (named after their favorite hang out, the Hula Hut Drive-In) lit up local abandoned roads with outlaw competition. One of Dean’s more notable achievements? Serving four days in the slammer for street racing, possibly the first hot rodder to earn the honor. Still draft age, the Air Force pulled him into the Korean War, where Moon picked a new skill that would prove useful in promoting his business: photography. Upon his return, he launched his own speed shop — Moon Automotive — with brother Buzz as his partner. One of hot rodding’s most influential businesses was on its way. The Moon product line kicked off with throttle linkages and fuel blocks before offering one unique item that captured customizers fancy: a foot-shaped gas pedal. More than 200 units sold in the first month. Next came the famous spun aluminum Moon fuel tank, followed by the even more famous Moon spun aluminum wheel discs. By the late 1950s, Moon was selling more than 10,000 discs per month! Moon Automotive did more than sell parts. Buzz and Dean were also skilled car builders and tuners, so much so that their revenue stream was split equally between parts sales and car construction. This is where Dean’s photography came into play, as he constantly fed the magazines, including Hot Rod, with professional quality new product images, tech how-to’s and car features. By the late 1950s, Moon moved into a new building in Santa Fe Springs on Norwalk Boulevard and renamed the company Moon Equipment. Which brings us to the iconic Moon Eyes logo. At first, the logo was a simple drawing of a yellow T roadster with the letters “Moon” placed above. Two small eyes peeked through the O’s. (He would type MQQN with Qs.) But Dean wanted something catchier, so he recruited a commercial artist from Disney who drew the now-famous Moon Eyes logo — arguably the most recognized hot rod trademark. By the early 1960s, Moon’s popularity had accelerated like a nitro-fed Top Fuel car. The company sponsored countless race cars for Bonneville, drags, even road racing. His shop was the go-to place for race car construction. Little known fact: the first Shelby Cobra had its small-block Ford V-8 installed in Moon’s shop. In 1962, he purchased Potvin Cams, keeping the camshaft and blower company alive. Dean still found time to indulge his own craving for cool cars. His ’32 Ford sedan was once tabbed as one of the “Ten Hottest Rods” — a Class B Sedan build by Dean and Buzz, featuring a ’42 Mercury Flathead with Evans heads and manifold, Moon dual ignition and a Weber cam. Dean Moon died at age 60 in 1987, and the company was sold to Shige Suganuma and Chico Kodama in 1992. Both were friends with Dean and were well aware of his important contributions to hot rodding. 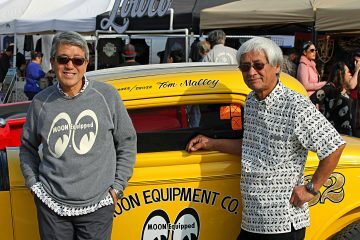 The new owners have kept Mooneyes USA in its same location in Santa Fe Springs and built a wildly successful Japanese location in Yokohama. Gary Medley has been a friend, ally and contributor to the performance community for decades. His interest in cars and journalism was pretty much a genetic imperative, as he is the son of Tom Medley, creator of Stroker McGurk. Medley’s own career path has traveled from the halls of Petersen Publishing to PR director for an Indy Car race to pitching tight-fitting Italian-made cycling shorts and countless other forms of high-speed life. Living between two volcanoes in Hood River, Oregon, Medley will be a regular Fuel Curve contributor when he’s not working to sustain his father’s legacy.